The first time I saw the Ashizuri Kaiteikan submarine tower was last year when my family took a 3-hour trip down the coast to enjoy the beautiful weather. We drove through Nakamura and the Hata district and enjoyed looking at the streets and buildings which were old and in the Showa* style. When we arrived there, the sea was very beautiful and the sun was shining. The beach was white and we enjoyed seeing strangely shaped rocks. We could see the Kaiteikan from the beach. It reminded me of Showa. Kaiteikan was not closed so we decided to go in. It took us couple minutes to walk to Kaiteikan from the beach because the path is about 500 meters long and was crawling with thousands of funamusi (sea slaters). I was wearing beach sandals and I was almost crying. There were too many and it was literally a revolting sight!! We returned recently and spoke with the man standing watch, a Mr. Hamada. The Kaiteikan is located in Asizuri in the south west part of Kochi prefecture. It was built in 1971 and opened in 1972. The official name is the Nature Museum Ashizuri Kaiteikan and the structure really embodies the atmosphere of Showa. The building seems a little old and the coloring is red and white so it catches people’s attention at a glance. The total height is 24, 30 meters and it descends is 7 meters beneath the waves. 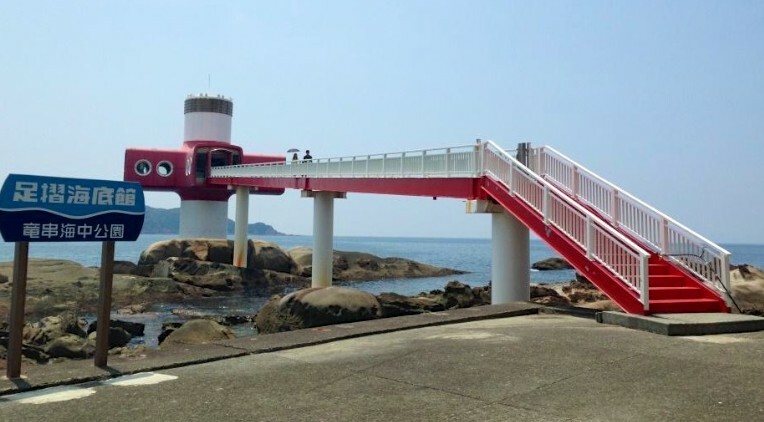 It is one of the seven biggest underwater observation towers in Japan. The others are in Hokkaido, Chiba, Wakayama (it has two), Saga and Okinawa. Ashizuri kaiteikan is the third oldest tower in those of seven. The oldest is in Okinawa and was built in 1970. The latest is in Hokkaido, 1996. The Ashizuri Kaiteikan is open from 8:30 am between April and August and from 9 between September and March. It both closes at 5 pm. 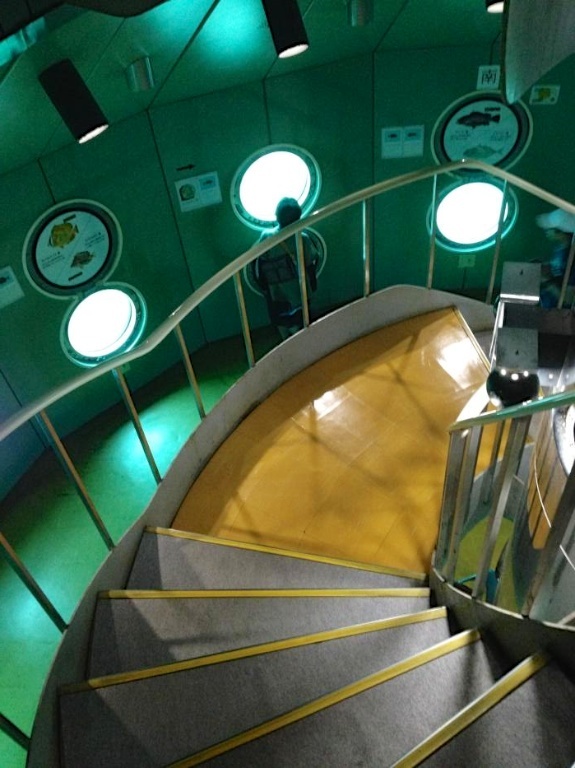 The entrance fee is 900 yen for adults and 450 yen for 4 years-old to high school students. It seems a little expensive, but about 40 thousand people visit each year anyway. 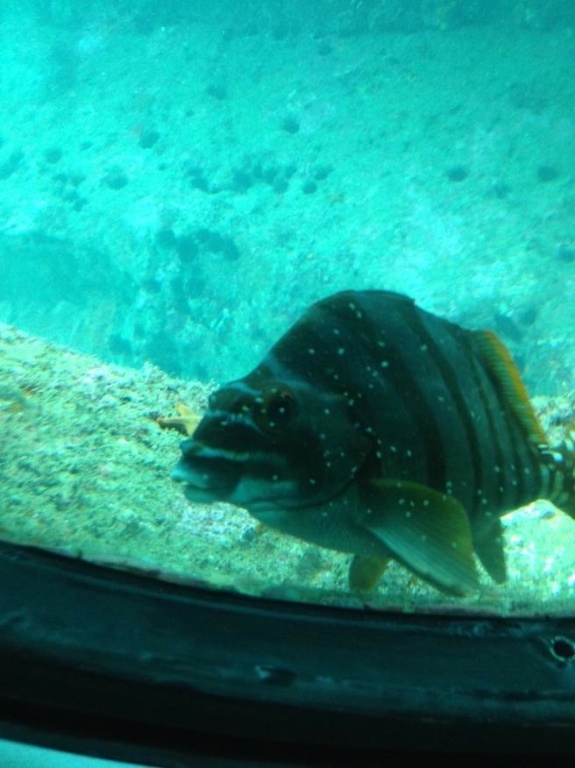 Visitors enjoy watching about 50 kinds of fish and other sea creatures from the port holes as though from a submarine. One surprising thing is that the fishes are very friendly! There are some pictures explaining the fishes and creatures so if visitors don’t know the names, they can easily find what they are looking at. 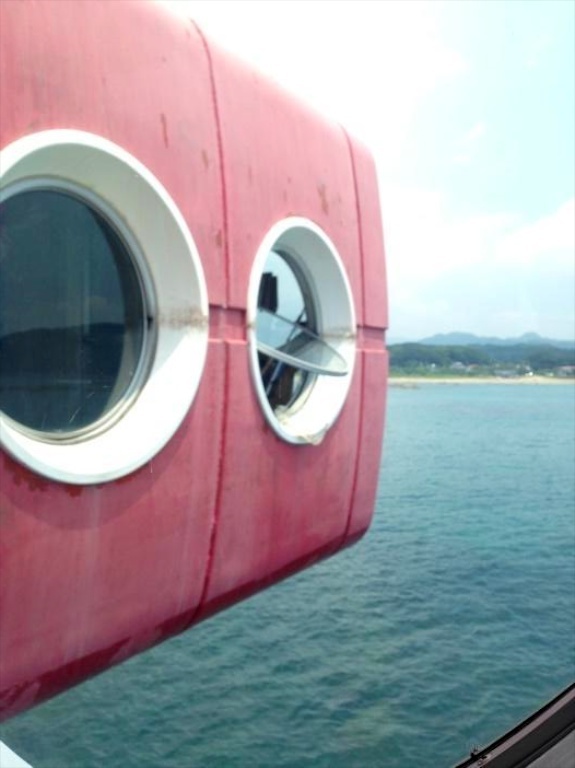 There are also port holes in the upper part of the building which provide great views of the ocean surface. We can learn the histroy of Kaiteikan there. The very famous company Kawasaki Juko built this building. Kawasaki Juko (Kawasaki Heavy Industries, Limited) is a famous Japanese company which is making many materials for cars, motorbikes and such so on. Kaiteikan is a really simple structure but it attracted many people in the 70’s. We can see some pictures upstairs in Kaiteikan when the Kaiteikan was opened. 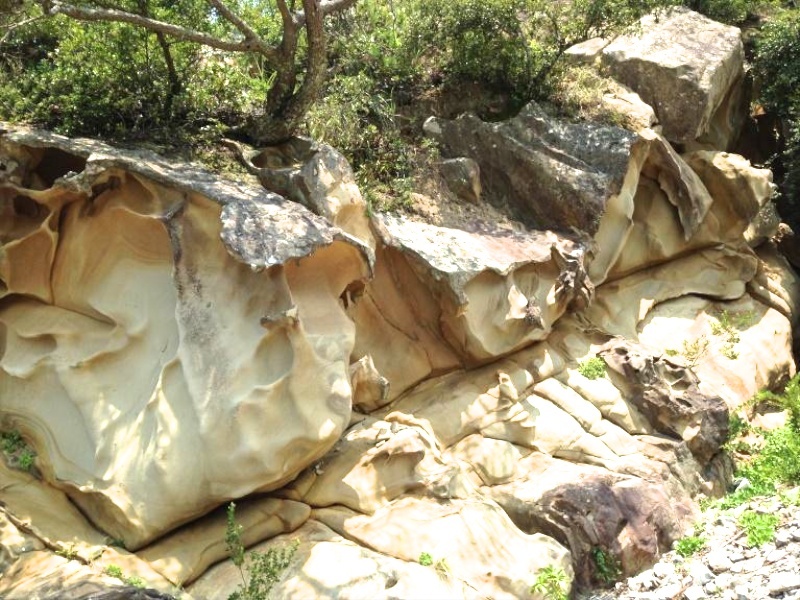 Kaiteikan was built because the area around Kaiteikan became a national park. Nishiyama Rihei, the boss of Nishiyama group company, had an idea to build Kaiteikan and he want visitors to watch and enjoy the great nature there. Nishiyama group is a kochi’s company groups of wide variety business. Most of the people visiting there are tourists from other prefectures, and the number of visitors is slowly decreasing every year. People’s interests have evolved over the last 40 years and some tourists spots are starting to show their age. One of the reasons for this shift might be the foreign exchange rate. In the 1970’s when the tower was built, the exchange rate was 360 yen to the dollar making travel abroad too expensive for most people. According to a published data on the web, the number of people who traveling abroad gradually increased in 70’s, but rocketed in 80’s. With the exchange rate now at about 100 yen to the dollar, it is easier to travel abroad, and places like the Kaiteikan are losing their popularity. In these 42 years, the environment of the sea changed a lot. The ocean temperature has risen 0.5 degree. Also, increasing floods caused by heavy rains changes the ocean environment. So the sea creatures which we can see in Kaiteikan have changed a little in these 42 years. The staff is realistic about Kaiteikan’s future. “We want here to be a place that can keep visitor’s memory,” the manager said. “But it may be impossible to rebuilt Kaiteikan.” People living in Koch know that big earthquake will come and that’s why it is very hard to keep Kaiteikan for long time from now. “The thinking is to eventually close the tower but leave it as a landmark and memory.” Since you know that this is 42 years old, it is already a nostalgic place where grandfathers take grandchildren. 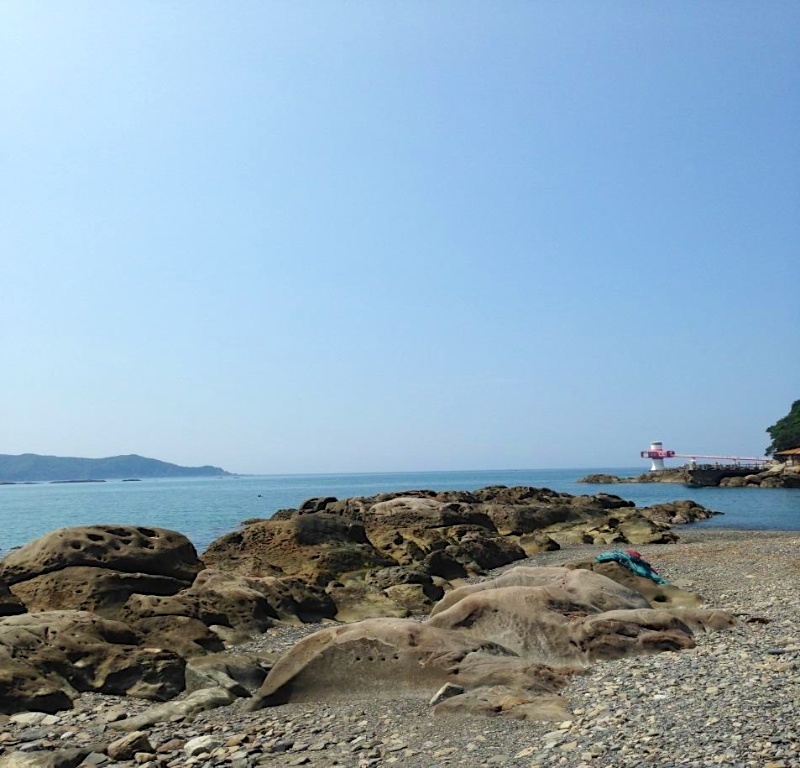 When the Kaiteikan eventually closes, they hope visitors will continue to enjoy the beautiful beaches and fishing. One of my dreams is to go Kaiteikan with my children and tell them “I came here when I was your age and it hasn’t changed at all ”. * Showa was an era between 1926 and 1989 in Japan that is outdated but loved by many people. Because of the Kochi peoples low ability to advertising thier prefecture, some intresting place are not known by other prefecture. So if I had a chance to bring my friends to Kochi, I would like to take them to Kaiteikan. I have been there many times. It’s a cool old retro sort of place. Thanks for writing about it on our site.